The Magic Tooth Fairy Game Kids love The Magic Tooth Fairy Game, they love the idea of it, they love the ‘magic’ process of placing a tooth into the bed and seeing it transformed into a gold coin, and they love the simple but engaging gameplay. While the build quality of the bed mechanism is not .. Kids love The Magic Tooth Fairy Game, they love the idea of it, they love the ‘magic’ process of placing a tooth into the bed and seeing it transformed into a gold coin, and they love the simple but engaging gameplay. While the build quality of the bed mechanism is not amazing, we nevertheless had great fun playing this game! The gameplay consists of spinning a spinner and moving around a board, which then directs you to collect teeth, place them in the hole under the pillow on the bed and then using the magic wand change the teeth into golden coins. If you have kids you probably know just how fascinated kids are by the process of pulling out wobbly teeth and the amazing work of the tooth fairy (ahem!) in changing the tooth for a coin. So this game is already onto a winner in that regard, all it needs to do is deliver a degree of the ‘magic’ of the real tooth fairy experience, and it does do this successfully. The game play is not very challenging, so you needn’t worry about high strategy in this game, it’s luck based, spin the spinner and do what the board space tells you. The only thing to watch out for is that there is a little text on the board i.e. ‘Wobbly Tooth’ or ‘Go To Bed’, which younger children may need a little help reading/understanding, but once they’ve played a few times they’ll get the hang of it! 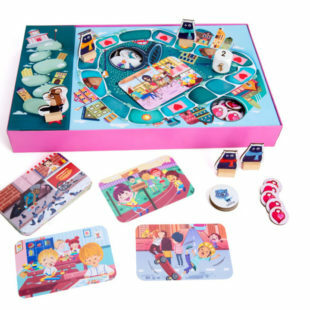 WHO’S IT FOR: The Magic Tooth Fairy Game should be great fun for kids of 5 and older looking for a quick and simple game. THE TOY VERDICT: Overall, we really liked The Magic Tooth Fairy Game. It’s easy and fun to play, and captures some of the magic kids perceive in swapping teeth for money in the real world.